To enter the Little Miss Coppertone contest and read the official rules, visit the Coppertone Facebook page. I grew up using Coppertone sunscreen lotions and have come to recognize them as trusted brand. They have a fun contest running until June 22, 2012. Sorry, no boys allowed! If you have a little girl age 2-8, all you have to do is submit a photo of her by June 22 to enter the Little Miss Coppertone Contest. Special guest judge Alison Sweeney will lead the judging team in selecting finalists and starting on July 13, America will vote to choose the next Little Miss Coppertone. The winner gets a dream family vacation and will be featured in a Coppertone print ad. Coppertone also has something in store for Coppertone WOMEN while they search for the new Little Miss Coppertone. 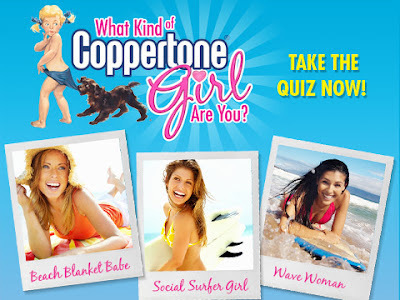 They know each of you is a Coppertone Girl in your own unique way and now you can find out what kind of Coppertone Girl you are by taking this fun quiz on Facebook. Take the quiz, then share it with your friends. "No Purchase Necessary. Contest Ends on 6/22/12. Click for Details".